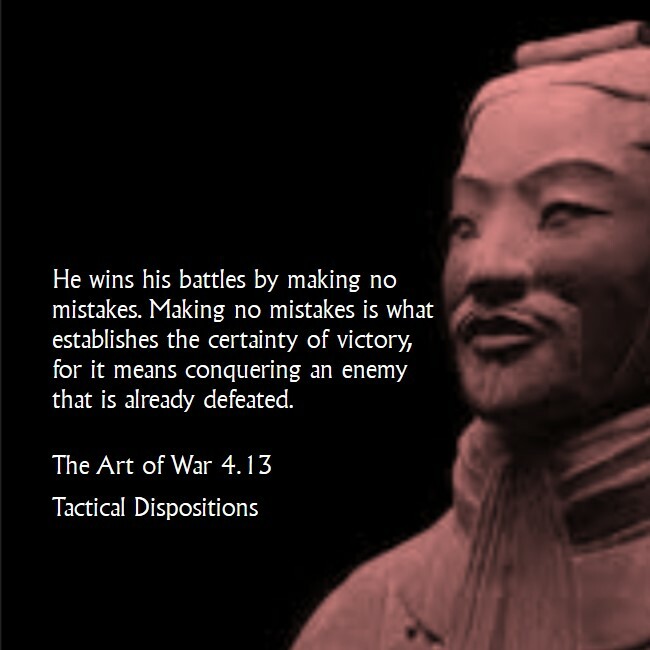 This is the fourth in a 7-part series comparing Sun Tzu’s The Art of War to youth wrestling and how we can apply these lessons in our own lives. The wrestler that makes a mistake ends up on his back. The only way to not get in this position is to not­ allow the opponent an opportunity. Becoming mistake-free results in victory. If your opponent has done his research on you, he will know it when he steps on the mat. Your reputation will precede you, and your opponent will arrive already defeated. As a mortarman in the Army, I couldn’t make a mistake. My team couldn’t make a mistake. One wrong move, one miscalculation, or one errant round could result in killing the people that counted on us for their protection. Mistakes sink ships on the ocean. They kill businesses by damaging their reputation and the trust people put in them. Mistakes prevent you from going where you want to go. It is difficult to be mistake free in life, but there are measures we can take to prevent mistakes. There are things we can do to offset the damage and not allow it to escalate into something we can’t fix. We can prepare, be ever-vigilant, and have a partner or coach that is looking out for us. Good coaches identify areas that need improvement. They correct issues early on so that they will not become a problem later on. They are there to prevent you from making mistakes. They are the checks and balances similar to the platoon sergeants and squad leaders of a fire team. They are there to watch, direct, and correct. When I was younger, I thought I was alone. I isolated myself and listened to my own counselling. It wasn’t very sound, and to this day I am still paying for some of those mistakes. What I needed back then was someone to keep me in check. There were plenty of people out there that would have done it, but I wasn’t looking. It wasn’t until I was older that I started looking. By then my exterior was already hardened making it more difficult for others to get through. I am still working on this area, still working on becoming vulnerable enough to those closest to me. The good news is that I am working on this area and getting better. It is hard to go through life alone and not make a mistake. We all need a partner, a coach, or a mentor that can see our blind spots. The influencers in your life cannot be afraid to offer counselling. And once they do, it is your job to trust them, listen, and take action. Only then can you come closer to becoming mistake free and establishing the certainty of your victory.